"Haitians truly value education and have carried the weight of funding it. Haitian students bring to school a sense of resiliency and a rich fund of knowledge, language, and culture from their every day experiences." Focusing on the Children â€“ Universal Education: A Renewal of Haitiâ€™s Education System (Haiti Advocacy Working Group). (n.d.). Retrieved September 10, 2014. The education system in Haiti is fraught with challenges. The Haitian constitution guarantees an education and requires compulsory education beginning at the primary level, but in reality the government does not have the resources to meet the demand. This has led to many systemic challenges facing the educators in Haiti. Limited Access: According the World Bank, only 50% of children attend school and the vast majority of students attend private schools, leaving the burden of payment to the family. The average cost of school equates to about $90/year, with the average Haitian family earning approximately $450 per year. Not surprisingly, drop out rates are high due to fluctuations in family income and most children who attend school do not graduate until they are in their 20s. Curriculum Shortage: Curriculum and books are in very short supply. When curriculum is available, the teacher will often have the only textbook. A Creole based national curriculum covering basic math, social studies, and science for the early primary levels is provided to some schools. Additional educational resources, including access to books, technology, or enrichment materials are non existent in most schools. 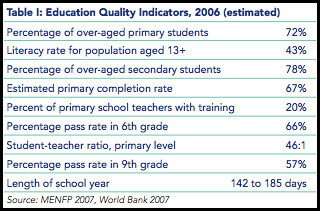 Teachers: The quality and availability of teachers is also a challenge. Recent statistics suggest that only 20% of teachers are properly qualified, but determining what standards are used to measure this qualification is difficult. Attempts to improve teacher competency are being made. Last month, the Haitian government announced new reform efforts that will require teachers to pass a competency exam by 2016. With almost 40% of the population being under 15 years old, there are simply not enough teachers. The World Bank has been running a program for several years to provide intensive teacher training so qualified teachers can enter the classroom in less time. Bilingual Education: The Haitian education model follows the French method with most instruction still done in the French language, although most of the population speaks Haitian Creole. Many primary schools are now moving to Haitian Creole. Formal education begins in preschool with an emphasis on songs and games. Children graduate to secondary school after 6th grade then complete an additional 7 years of secondary school, one more year than is required in the U.S. Unlike in the U.S., a competency exam is required to pass grades 6, 9, 12, and 13. These exams are administered in French, contributing to a 70% failure rate because of the lack of French fluency throughout the general population. The primary school at Lifeline is a private school funded by donations and tuition. Classes are held during the morning hours for preschool to 6th grade. Students are taught primarily in Creole. Lifeline employs about a dozen teachers and serves about 300 students. In addition, Lifeline seeks to employ an English teacher when funds are available. The school is not immune to the system-wide challenges experienced across Haiti. The pace of education moves very slowly and many students struggle with basic reading and math. Enforcing class attendance is difficult and school supplies, including curriculum, are in very short supply, leaving children to share books, notebooks and pencils. Even with these difficulties, the teachers persevere, working diligently with the very limited resources they have. And they are having some success. Students who have graduated from the primary school attend classes at two secondary schools near Lifeline, La Renaissance and College Eben-Ezer. One of Haiti Lifeline's objectives is to support the children as they advance through school. Being able to attend school year after year without the interruptions that are commonplace for many Haitian students contributes to a better education for the Lifeline's secondary students. Cost for secondary tuition is significantly higher than what is needed for the children attending the primary school. A basic child sponsorship that covers food, clothing and education is $40/month. Each secondary student needs at least 4 sponsors. Lifeline is committed to sponsoring them until they turn 21. A more recent goal has been to provide resources through the establishment of a library. A well written and illustrated book has the power to ignite literacy. Access to a library can fan that spark into a flame of self directed learning. 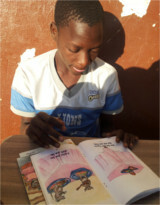 The Biblioteque de Lifeline holds much promise for being able to greatly expand and improve the education provided at Lifeline. Currently, the library has approximately 900 books, with about a third of those being in French and Haitian Creole. Our goal is to regularly expand the French and Creole selections. The library was welcomed with great enthusiasm by the children and teachers. 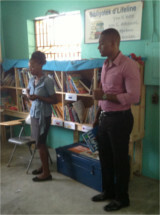 Opening the doors of the library has been a frequently requested activity while the teams are in Haiti. Unfortunately, the doors remained closed at other times of the year. We are excited to announce that with our promise of financial support, Nicole, Lifeline's founder and director, has hired a librarian and assistant librarian. The librarian is fluent in English, French, and Creole and will also be teaching English at Lifeline. The expectation is they will significantly improve access for the children while also enabling the school teachers to use the library resources in their classrooms. The cost of supporting the librarians' salaries is $450/month or less than $125/week. Please share this immediate need for education and library sponsorships with your family, friends, and churches. One time donations can also make a big impact. Go to haitilifeline.org/sponsorship or contact us to find out more. "It is hoped that a sustainable education system will emerge from the rubble of the earthquake. This system should facilitate a quality education for all, which complements the wonderfully kind nature of the Haitian people, and serves as an avenue to the food, housing, employment, health, and transportation needs of this devastated country. This system can only come about through the lasting commitment to accessibility from within Haiti and the world outside. The only way out of this situation is accessibility." Inside the guest house and among English speaking team members, it is easy to forget that lack of common language can be an insurmountable barrier. Outside that bubble, though, the language barrier quickly drives any attempt at meaningful communication into wild gesticulations. Judney and Juneas Joseph step into this gap, crossing the barrier. In the process they provide greater opportunity for cross-cultural communication and understanding. They are vital, invaluable and deeply appreciated members of each team. Juneas and Judney learned to speak English while living in the US during their high school years. They have been translating for Lifeline for about two years. 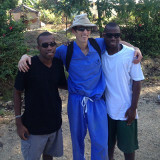 They travel from their hometown of Cap-Haitian, six hours north of Port au Prince, to translate for the Lifeline teams. They usually work together on the medical teams and come individually for the smaller teams. For this edition of the newsletter, we interviewed Judney. Stay tuned for next time to meet Juneas. I met Judney on our first trip to Haiti. We had just arrived at Lifeline and I was processing the sights and sounds of our drive from the airport. Several children waited on the front porch to greet their adoptive parents, and amidst the flurry of joyful greetings, I stood by, unsure of what to do. It was then that Judney approached and introduced himself. I donâ€™t remember the details of our conversation, but I remember his kind and welcoming demeanor. Seeing Judney flash that winning smile is definitely a treat and I know I have given him a few laughs as Iâ€™ve bumbled along in my attempts to speak Creole. He is always extremely gracious and patient. It is surprising that with the small amount of English the children at Lifeline speak, a lot of communication still happens. Sometimes, though, trying to understand each other can be like a game of Mad Gabs, while each of us tries to communicate in the otherâ€™s language with misplaced syllable accents, wrong pronunciation, and an unpracticed tongue. It can lead to some truly comical moments. One day, a young boy from the school came to me and repeated a phrase several times. I repeated it back to him, but still had no idea what he was trying to say. I finally went to Judney and told him, â€œHe keeps saying, â€œAh pod som SUNG.â€ Judney told me, â€œI pod.â€œ I still didnâ€™t get it. â€œHeâ€™s saying he wants an iPod. Samsung,â€ Judney repeated. Ooooh! Feeling a bit stupid, since the boy was saying exactly that, I returned to disappoint him with my lack of an iPod. Along with translating, Judney enjoys mixing it up with the teams on the basketball court and soccer field. And, he makes a great partner for an early morning workout as well. He graciously answered a few q90uestions for us. What do you enjoy most about being the Lifeline translator? The fact that God gave me an opportunity to be a part of a great ministry. Is there something you think would be valuable for the teams to know when travelling to Haiti? Haiti is a small, beautiful island with a big history. Do you have a favorite or funny memory of something that has happened with one of the Lifeline teams? There are many memories and funny moments with each team. I enjoyed all of them! What are your plans for furthering your education in the future? My future plan in education is to get to a college and have a degree in Business Administration. If God allows me to complete my educational goals, I would then obtain employment and prepare myself financially, socially, and mentally to build a family based on the teaching of the word of God. How many brothers and sisters do you have? Are you the oldest? I have three brothers and one sister. Iâ€™m the second oldest. My favorite food is a Haitian dish called Griot- it consist of fried plantains with goat and spicy coleslaw. Blended Juice (papaya, mango, bread fruit), passion fruit, Fruit Champagne. Play pickup basketball game, video game (ps3) and study the Bible. Do you have a favorite Bible verse or passage that you find encouragement from? James 1:2-4 Count it all joy, brothers, when you meet trials of various kinds, for you know that the testing of your faith produces steadfastness. And let steadfastness have its full effect, that you may be perfect and complete, lacking nothing. 2 Corinthians 12:8-10 Three times I pleaded with the Lord about this, that it should leave me. But he said to me, â€œMy grace is sufficient for you, for my power is made perfect in weakness.â€ Therefore, I will boast all the more gladly of my weaknesses, so that the power of Christ may rest upon me. For the sake of Christ, then, I am content with weaknesses, insults, hardships, persecutions and calamities. For, when I am weak, then I am strong. Finally, for those who have seen you doing those early morning workouts, how many push-ups can you do at one time? Pull-ups? As for now I can do approximately 40 push-ups and 20 pull-ups. The third annual Capitol Craze was once again a wet and wild success. Surprising new challenges dotted the course and were met with rave reviews. The Muddy Moguls boasted large, deep pits of mud and water surrounded by walls of --you guessed it--more mud. The only way to get through them was brute strength combined with a huge dose of camaraderie. Team work was required to be pushed, pulled, and shoved over the wall of sludge then turn around and reciprocate to the person who just rescued you from the miry abyss. Part of the accomplishment was making it to the end with both shoes still in your possession. A newly designed climbing wall tested upper body strength and shoe traction simultaneously as each racer had to maneuver to the top of a mud drenched slanted wall with only a knotted rope to hold onto. The biggest surprise, literally, was the water slide. It doubled in size this year, with a slide time that could rival those at the best amusement parks. Favorites from last year delighted and challenged. 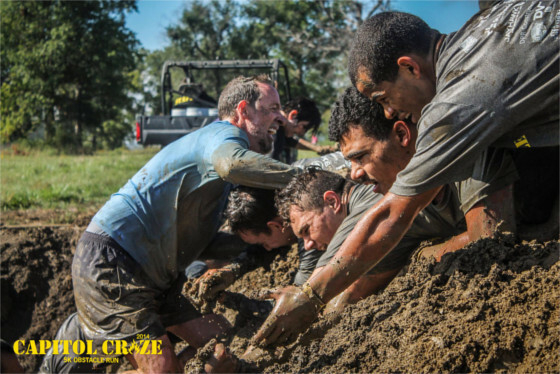 Mud crawls, high climbs, tight ropes, hurdles and fire jumps gave definite bragging rights to all finishers. This yearâ€™s event was again the largest single fundraiser for Lifeline. Thanks to the dedicated, motivated, and hard working volunteers, $28,000 was raised for the general and education funds at Lifeline. If forging your way through the mud and muck isnâ€™t your thing, consider volunteering for next yearâ€™s event. After a brief hiatus, the construction and planning crew will put their heads together to see how they can upgrade the race for next year. Volunteers are vital and needed in many areas, not just on race day. Take a lesson from this years muddy moguls and jump in with the team and help share the load. Contact the organizers at http://capitolcraze.com/contact-us/, let them know what you do well, and find out how your skills can be put to good use. Final preparations are being made for the medical and construction team that heads to Lifeline this weekend. The team of 30 will be led by Crystal Smith and Matt Vincent. They will be providing medical clinics for the community, at a pastorâ€™s conference, and completing regular check ups on all the children and school children at Lifeline. They also have work projects to complete around the campus. A shipment including clinic supplies and a new generator was prepared and shipped with the US Air Force Denton Program. Pray that it will arrive before the team. That God will multiply their efforts to be able to serve the greatest number of people. For travel mercies and health for the team, wisdom in treating health concerns, and for God to be glorified as they rely on His provision and grace. The summer VBS team shared a slideshow of their trip. Take a look! Copyright Â© 2014 Haiti Lifeline Ministries, All rights reserved.